The Roush Burnout Contest at #am2014 brought out a wide-range of competitors, but none of them were as dedicated to winning as this drifter in a New Edge GT! Vaughn Gittin Jr. was not the only drifter at the AmericanMuscle Car Show this year; joining Vaughn and his 2015 RTR reveal was Jared Licklider who brought everything he had to the burnout box at the Roush Burnout Contest in his push rod 5.0L swapped New Edge Mustang. Jared started his performance off with a quick doughnut and threw in a figure-8 into the middle of his burnout, which when paired with a huge smokey burnout, secured him the 1st place in the burnout contest. Brett “Big Schwag” Wagner presented Jared with his trophy and prizes from Roush for his awesome burnout in his 2001 Mustang. Jared has been drifting since 2010 in the Northeast and Mid-Atlantic area, appearing at tracks like Englishtown Raceway and Summit Point Motor Sports Park. Like Vaughn Gittin Jr., Jared represents a growing minority of drifters who realize the huge potential of using the Mustang chassis in drift applications. 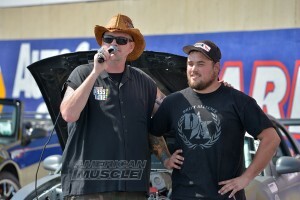 Jared Licklider definitely brought a different energy to the Roush Burnout Competition, but it was welcomed and enjoyed by those in attendance. If you are interested in learning more about Jared, check out his profile on USDrift.com! IS HE USEING LIMITED SLIP T-2 TORSEN !! !